Do all hair dryers work the same? Not really, a good hairdryer or a good hair straightening iron is what will make the difference between 30 minutes in front of the mirror or a 10-minute blow and you and come out looking like you just left the salon. The shelves are full of different hair dryers and it can be confusing which one to choose that will give you the desired results as well as your money worth. Hair dryer is an electronic device that makes your hair drying simpler and convenient via blow drying. It is a compact device to dry and style your hair. Hair dryers are classified according to the technology they employ. The functionality remains mostly the same. This technology generates a number of negatively charged ions when the air passes through the electric current in the nichrome wire. These negatively charged ions work in the breaking down of the positively charged water molecules to dry the hair without losing the moisture. Ceramic hair dryers use a ceramic heating material which provides heat evenly to prevent the damage to your hair. The infrared heat emitted by this hair dryer penetrates into the hair shaft to lock in the moisture. In Tourmaline technology, a multi-colored mineral is used which is a pyroelectric and piezoelectric mineral. This mineral emits both the negatively charged ions and the infrared heat. Titanium hair dryers use the titanium heating coil. They work much quicker than the ionic, ceramic or even tourmaline hair dryers. Have thick hair and wondering what is the best hair dryer for thick hair? The Panasonic Nanoe hairdryer employs a unique and advanced ionic hair drying technology. It makes the blow drying hair easy and quick. It also prevents moisture loss and reduces the heat damage. This hair dryer has 1875-Watt power much unlike other ionic hair dryers. It draws in the naturally occurring moisture content from the air and transforms it into many micro-size particles. These particles contain 1,000 times more moisture content than the regular ionic hair dryers. These microparticles are then infused into each hair strand to reduce frizzing of hair and shield the hair from the heat damage. As a result, you get smooth, shiny, and beautiful-looking hair. Two professional speeds- high and low. Can accommodate different hair styles and types. Three professional quality attachments for styling and hair touch-ups. Delivers both soft and strong airflows. Diffuser to creates body and volume. A heavy-duty professional hair dryer of 9-ft.
A removable and easy-to-clean filter. The Panasonic Nanoe hair dryer is especially suitable for thick hair that can take eons to dry. Besides all the high-tech features, the Panasonic Nanoe hair dryer also comes with a plenty of other perks which makes it worth the money spent. And despite not having many settings like other expensive hair dryers, Panasonic Nanoe still provides you with three heat settings and two speed settings. 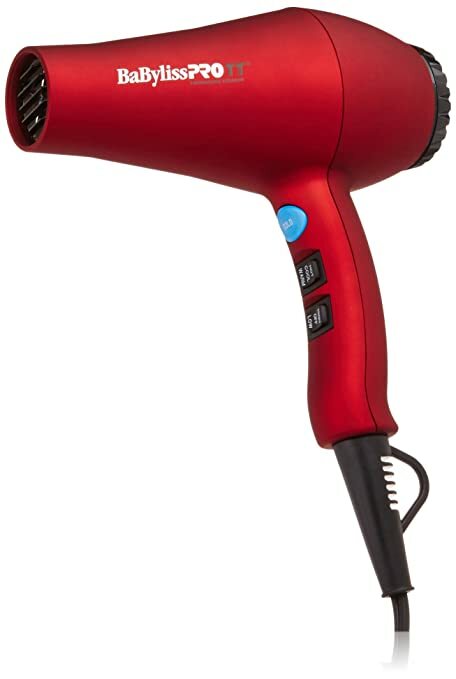 Conair hair dryer is a 1875-watt ceramic hair dryer that uses the tourmaline technology to help prevent the damage. The ionic technology offers smooth and shiny hair. A high-torque DC motor speeds up the process of hair drying. It comes with a trusty cool shot function. It offers creative hairstyling and makes it easy to handle the hair dryer with a comfortable grip. It reduces hair frizzing up to 75% with its Soft Touch’s ionic technology. Conair uses both tourmaline ceramic and ion technology which helps in achieving smooth and shiny hair without any damage. BaByliss name is a well-known name in the world of professional hair stylists. Despite its popularity, BaByliss is still affordable, unlike other well-known hair dryers. You can easily learn to use the Pro Carrera 2 in the comfort of your own home. BaByliss Pro Carrera2 Dryer is an advanced and the finest commercial-grade hair dryer made of porcelain ceramic. It has improved heat distribution functionality and has also increased the far-infrared heat which makes the hair look healthy and shiny. The professional power AC motor offers fast hair drying with 6 heat and speed settings. It is perfect for all types of hair and style. BaByliss reduces the heat damage to the hair and pumps up the thin hair. This hair dryer employs a soft-touch rubberized housing that offers maximum grip and long 10-foot cord. While it can go well with all types of hair, Pro Carerra 2 is specifically great for thin hair which is prone to heat damage. The Infrared technology and the ceramic interior together even out the heating. The negative ion technology reduces hair loss and frizzing. The concentrator attachment offers precision styling and the cool-shot button gives a frizz-free hairstyle. This 1,900-watt professional hair dryer packs a lot of power. I know I never write about hair dryers but I thought, what is a clear well cared for face with hair looking not so presentable? that`s why I ventured away from microdermabrasion products and machines I always cover and did this one post on hair dryers. Hair dryers have surely come a long way. Many of the best hair dryers brands now manufacture new and different types of hair dryers. The hair dryers are now being manufactured with a combination of different types of hair dryer technologies so that the advantages of different hair dryers can be in a single hair dryer. The combination of these technologies offers an effective styling and drying of hair with minimum damage to the hair. But you need to pick the hair dryer suitable for the type of hair you have. These hair dryers looks good. Great post! Thanks for sharing ♥ ♥ By any chance you are interested on doing collaborations, you can check out the collaborations portal of Phlanx.com and connect with amazing brands! Thanks for stopping by,will check your site and let you know.